This week, with help from Alex Olwal and Julia Ma, I finally managed to scratch a project itch that has been lingering since the spring. 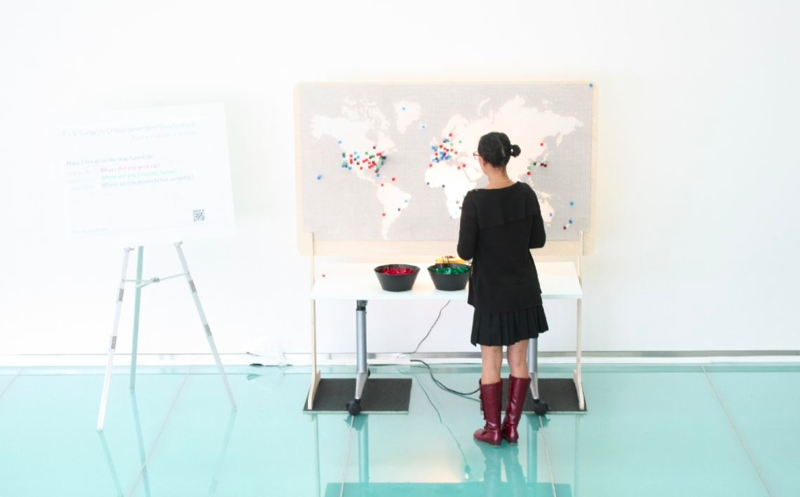 The installation uses crowd sourcing to actively build a tangible visualization of attendee demographics. A world map covered by transparent LEGO baseplates stands at a conference, and bowls of transparent colored LEGO bricks sit nearby. Each person places a green brick on where they grew up, a red brick on where they currently live, and a blue brick on where they dream to live someday. This creates a 3-dimensional visualization. A light shines through the back-side, allowing the viewer to immediately see where the hot-spots are as those areas are more dense with bricks. 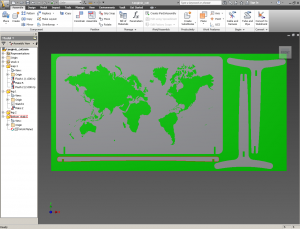 I designed the piece in Autodesk Inventor. 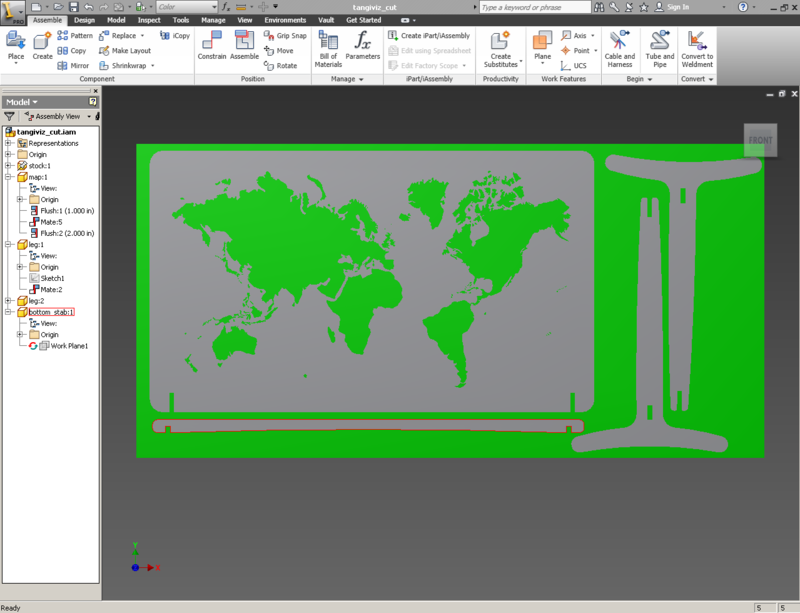 I traced a Miller cylindrical projection of the world with the spline tool into a sketch, then extruded. It was my first experiment using a tablet (Wacom Bamboo) with Inventor, and I am quite pleased. Next, I would like to try a 3D mouse and the tablet; control view with my left hand, and sketch with my right. The only downside, was the spline(s) became quite large and despite having 24GB of RAM, Inventor got a little unresponsive. Maybe I need to upgrade my video card. 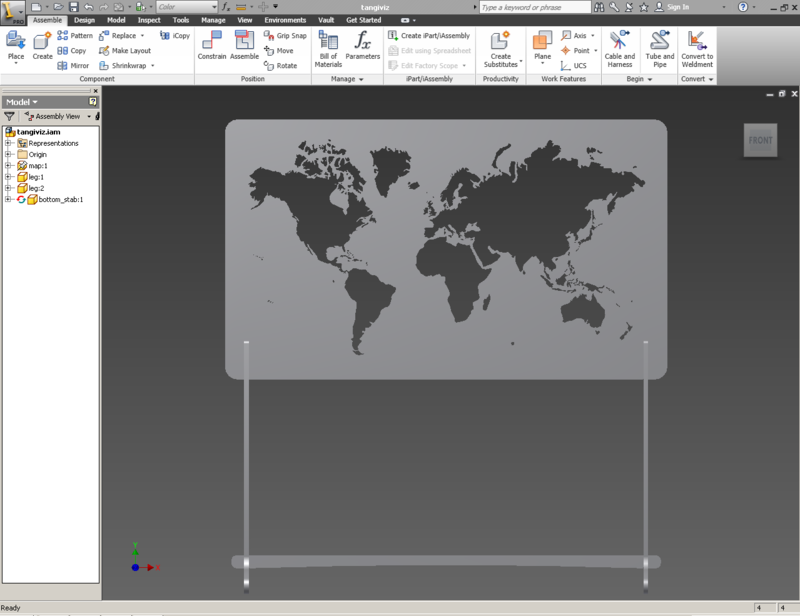 I panelized the parts in inventor also. 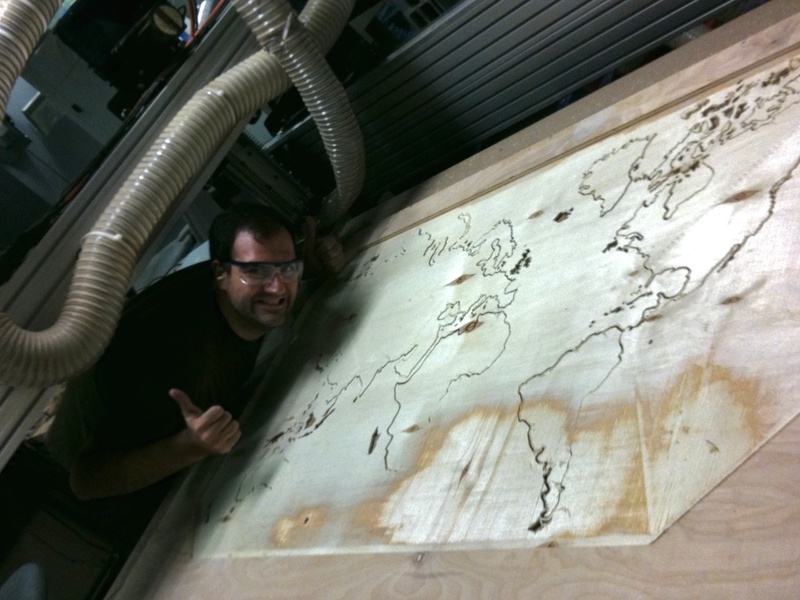 For my first ShopBot adventure, this project went fairly smoothly. There were three cuts, first a pocket (I wanted to put the legos in from the reverse side), then a profile cut for the map, then a profile cut to cut out all the pieces. I chose a 3/4 (nominal) AA hardwood ply. I cut the pocket with a 5/8 two flute upspiral endmill at 10K RPM and 200ipm. I cut the profiles with a 1/8 two flute upspiral engmill at 13K RPM and 120ipm. The 5/8 endmill tore the plywood a little on the top, but didn’t matter since this was the reverse. The 1/8 endmill made beautiful cuts. While cutting the pocket, the dust collection system became frequently clogged. This required me to pause the machine, unclog the vacuum and restart the cut. This worked about eight times. About a minute after the eigth pause, the program crashed. The spindle remained running, but the axes stopped moving (thankfully). I emergency stopped the machine and restarted the cut from the beginning because I could not figure out how to start from a line number. I considered editing the file in a text editor, but did not because it was my first experience with the machine. My nominal 3/4 hardwood ply was actually 0.733 inches thick, and for the tab construction, I undersized the slots by 30 thou to 0.7 inches. This worked very well. Total luck. 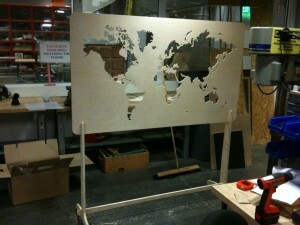 The project was installed on the 6th floor for Sponsor Member’s Week. We recorded a timelapse of the installation’s growth. The timelapse of the first day is shown below. Watching the video, interesting things of note are: @1:30 the first tower is constructed to support Boston, @4:50 a space invader is built, and @5:10 the Tokyo tower is constructed. We’re excited about the future of this installation. The idea of writing a distributed program to enable attendees to visualize their own data, in a fun and interactive method is quite powerful. We’re excited about collaborations in this space, feel free to drop me a line!